Since 2000, the Nevada Field Office has provided more than $13.4 million to communities near the NNSS to enhance county emergency response capabilities. To fund this grant, approved waste generators are charged an additional $.50 per cubic foot of low- and mixed-level waste disposed. 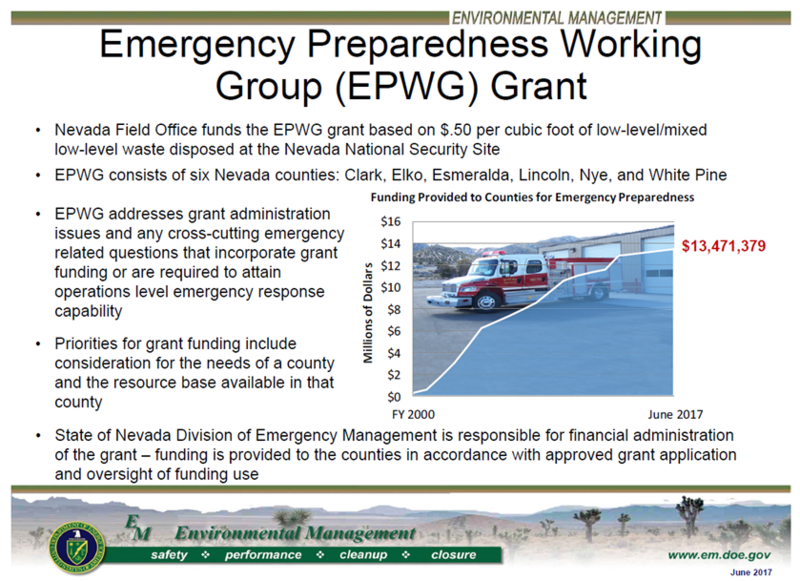 The Nevada Division of Emergency Management administers the funding, which is needs-based and distributed according to applications submitted by the counties. Clark, Elko, Esmeralda, Lincoln, Nye, and White Pine counties have used the grant funds for emergency communication and response equipment, facilities, and salaries for emergency managers and training officers.